No longer a privilege for the few, access to 17 of the world’s most treasured museums is now available to anyone with an internet connection. Google Art Project welcomes us to the halls of London’s Tate Britain, Madrid’s Reina Sofia, St. Petersburg’s Hermitage. See The Birth of Venus in Florence then Starry Night in New York — from a curator’s perspective, down to each microscopic crack in the canvas. The remarkably elegant and intuitive interface feels perfectly on-brand for Google, without distracting from the visually rich content on the site. Visitors can move through the museums on an interactive floor plan, choose the works they’d like to see and read informative curator’s notes. It’s immersive. Personal. Beyond digital, it’s a real-life experience. We had to take pains that the site didn’t usurp the cultural and civic power of the museums themselves. Of course, we needed to be sure that the site was enjoyable and easy-to-use–but we also needed to create a clear distinction between the live, in-person museum-going experience and the online experience. In essence, we were creating a new model for viewing art. Online viewers have a chance to see art differently from people in museums; for one thing, using Picasa, we can offer them the opportunity to go to the mega-pixel level, something no one could do in an actual museum unless they were a curator or restorer. 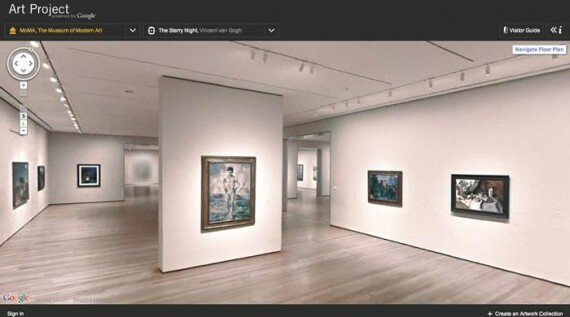 For lots of people, Google Art Project provides their first-ever interaction with some of the world’s great art. So many people can’t afford to travel the world, or don’t have access to high-quality art books–but now they can experience the same delighted or awed engagement with our world’s masterworks as a person physically standing in the halls of the great museums. The site has drawn rave reviews from critics and users globally, and millions upon millions of people have visited the site. We like to think of our work on Google Art Project as uniting the world in wonder: and if there’s a greater impact than that, we’d like to hear it! There are two main areas of the site. The first is the museum “gallery view”, which employs Google Street View to enable people to explore museums’ galleries in the same way Street View in Google Maps lets people to wander city streets virtually. In each museum, featured artwork are mapped to their longitude and latitude within museum being delivered by Street View. 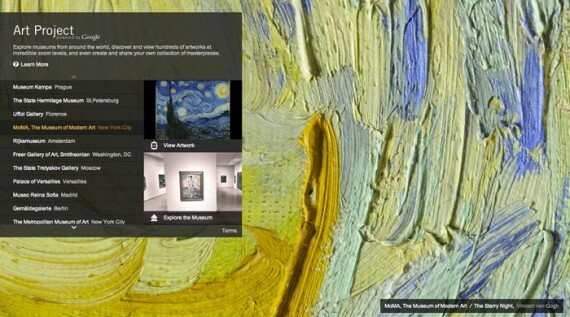 This location data allows site visitors to see which artwork can be explored further, and link to that information in the second main section, the artwork “microscope view”. The artwork “microscope view” uses Picasa to deliver amazingly high-resolution captures of artwork. Users can zoom into the smallest details of artwork, allowing them to see details from a vantage previously only seen by art restorers. Visitors can then learn more about the artwork they are viewing through content delivered through the Google Scholar, Google Docs and YouTube APIs. Visitors can also share their experience on Art Project with friends. By logging in with their Google account, people can create personalized collections of artwork from throughout the site. Using the integrated Goo.gl URL shortener, they can then share unique links to their collections by email, or to various web services.